Sometimes the foods I am obsessed with take me by surprise. 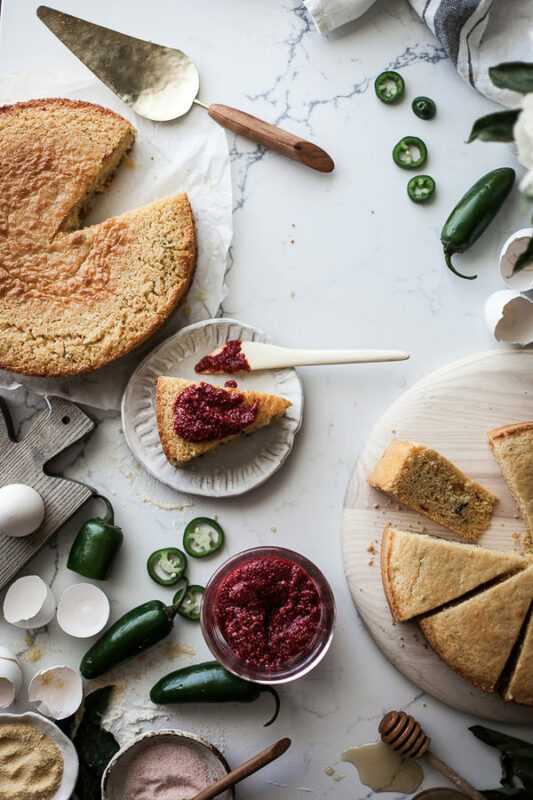 Take this jalapeno cornbread, for instance. I’ve avoided jalapenos all of my life, being the designated “family spice wuss”, as my husband so lovingly puts it. Those spicy little peppers terrify me. Or did. Until the day I discovered that removing the seeds removes the majority of the spice and what you are left with is a tolerably peppy little flavor gem. One day I was at a business lunch with my husband and he ordered the restaurants jalapeno cornbread. I was wary at first, but one bite and I fell head over heals in love. It was super dense, sweet, slightly spicy, buttery, with a fragrant sweet corn flavor. My perfect cornbread. I’ve been trying to recreate it ever since and I think I have finally done so. My husband thinks it’s even better that the restaurant version, so mission accomplished! 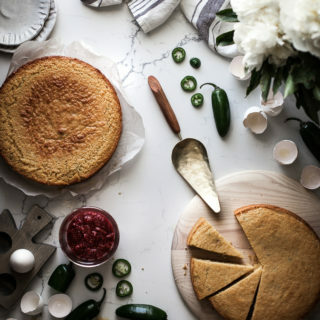 First step to making the ultimate cornbread? Freshly ground cornmeal. And guess what?! It’s super easy with a Vitamix! I just ground up corn kernels in my dry container for fresh, fragrant cornmeal in just a few minutes. How cool is that!? 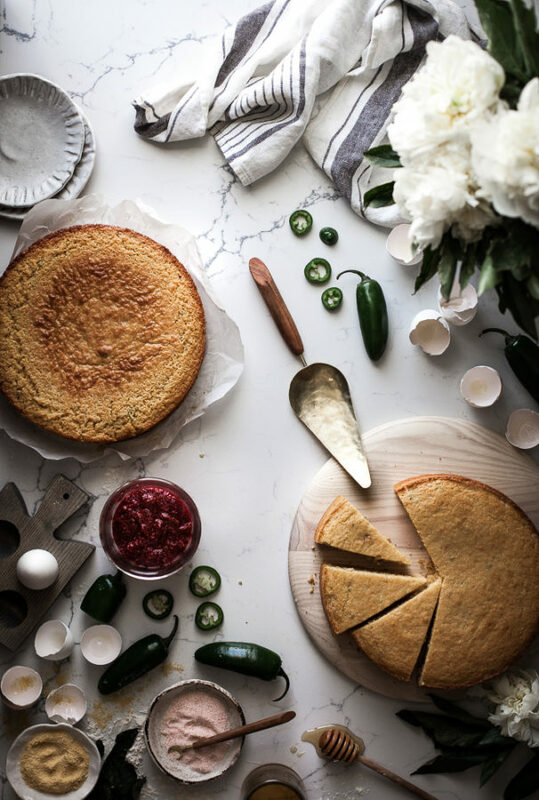 Not only does the Vitamix create freshly ground cornmeal for this bread, it saves your fingers from the stinging, spicy waters of jalapeno chopping. Instead of dicing up my jalapenos, I simply sliced the tops off, then sliced the sides off of the jalapeno, completely avoiding the seeds and their painful oils. 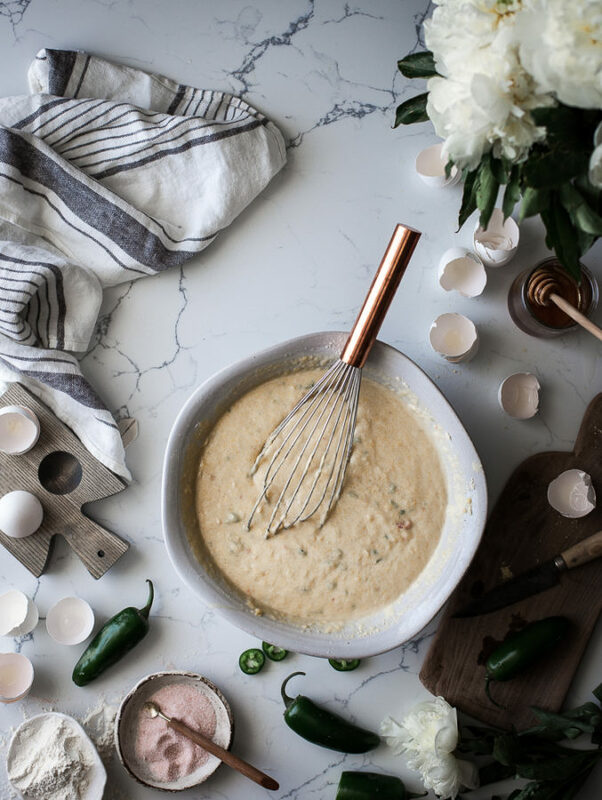 By throwing the strips of jalapeno into the vitamix along with the milk, you can blend for a few seconds at the lowest speeds and the mixer will chop the peppers for you. 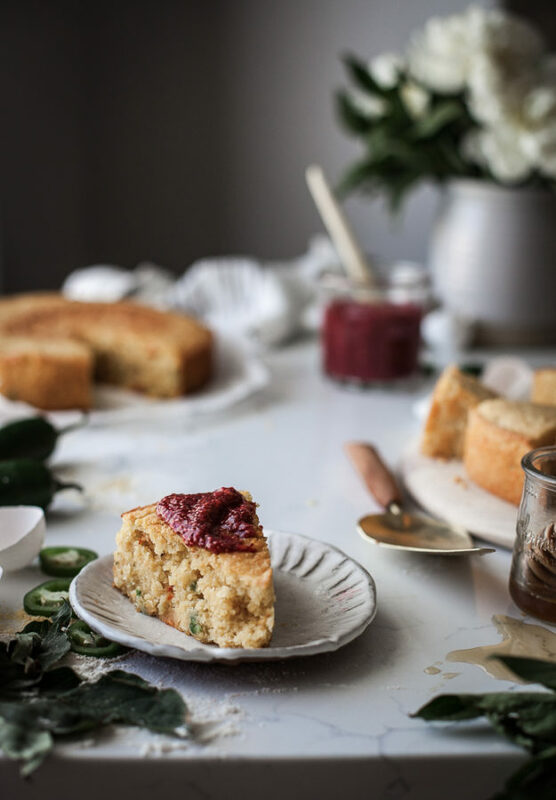 I love this method because not only does it save me from working a lot with the peppers, but it infused the cornbread more fully with the jalapeno flavor, leaving it studded with beautiful specks of red and green. 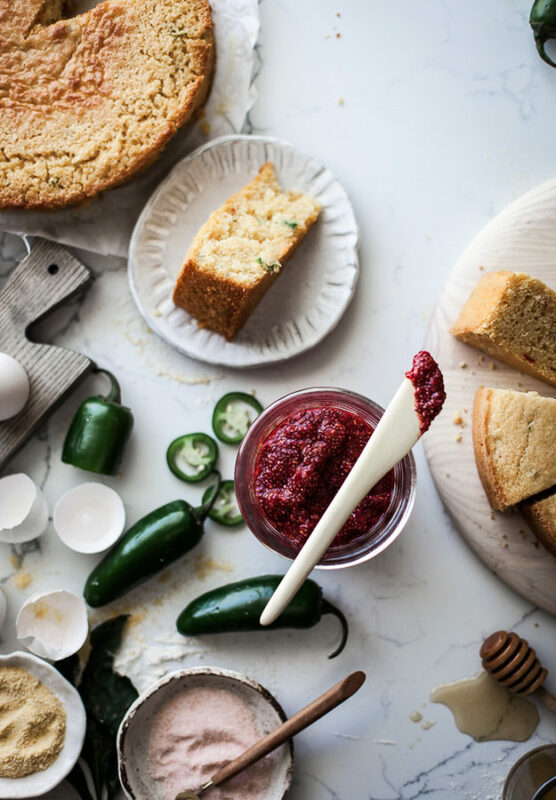 As if this recipe didn’t leave you with enough blender love, how about a insanely quick jam recipe, made(of course), in the Vitamix! Have you ever tried a chia seed jam? Chia seeds soak up liquid and expand to make a gelatinous mixture and are perfect for raw jams. Why raw? 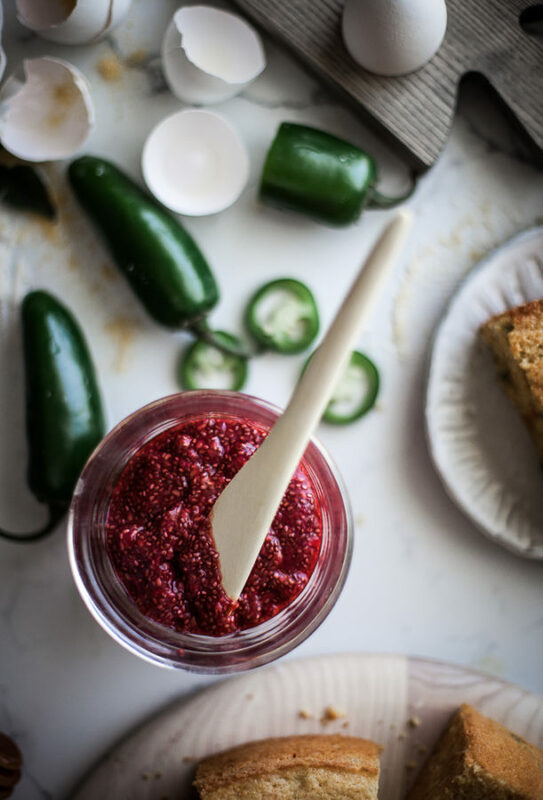 It makes me so sad to cook up all of that fresh, tangy flavor from my lovely little raspberries, and this jam lets you keep every ounce of their fresh, fruity flavor. 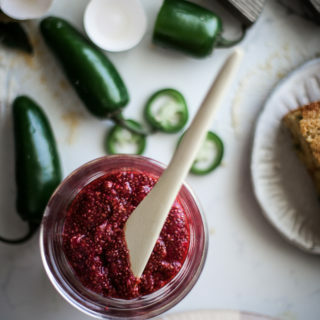 You literally just blend fresh berries, lime juice, maple syrup, and a few tablespoons of chia seeds in the blender for about 30 seconds, let it set up, and have a gorgeous jam for spreading on bread or eating by the spoonful. And you can avoid and pectins or gelatins, if that floats your boat. And if raspberries aren’t your thing? 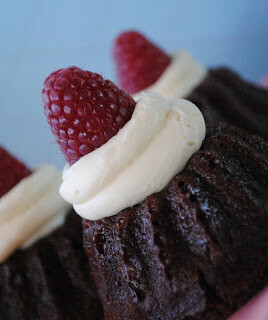 Any berry can be used in this recipe! Oh, I would also recommend a nice honey butter to serve along side this cornbread. Why? Because BUTTER. The stuff of life. Doesn’t it belong on everything? 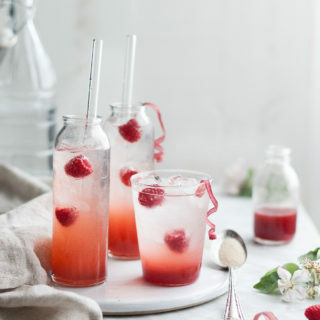 Place the raspberries, lime juice, maple syrup, and chia seeds in a high speed blender, like a Vitamix. Pulse a few times to combine. Let sit for 5 minutes so that the chia seeds can soften. Puree the mixture together for 30 seconds on speed 1. You want the raspberries to be completely broken down, but not for the chia seeds to begin to be chopped up. Scoop the mixture into an airtight container and let it set up in the fridge, where it will thicken up. Use as you would any jam! Place the corn kernels in the dry container of a Vitamix. Start at speed 1 and slowly work your way up to speed 10, grinding until the corn becomes a fine meal. If you feel that the cornmeal is getting too hot while grinding, stop the blender and let the corn cool for a1/2 hour or so, then continue with the grinding. Store in an airtight container. Line a 9" springform pan with parchment paper and grease the sides. Set aside. Preheat the oven to 350 degrees. 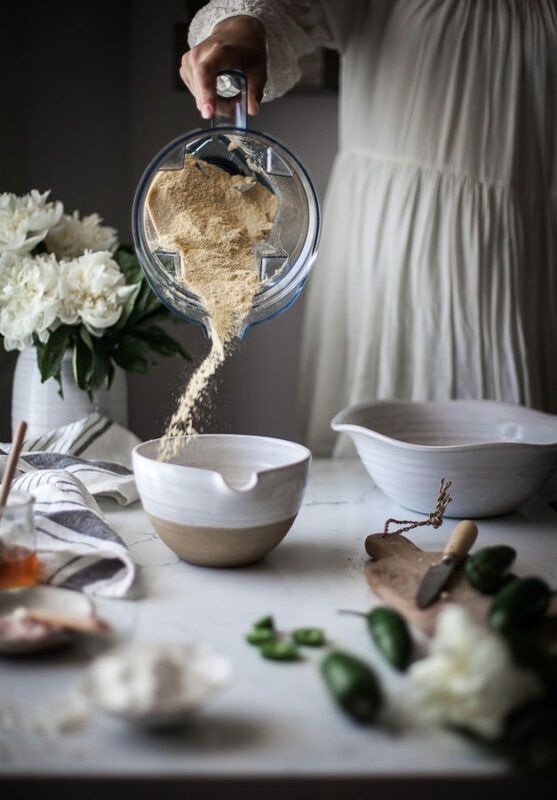 Place the cornmeal, flour, sweet rice flour, baking powder, and salt in a small mixing bowl. 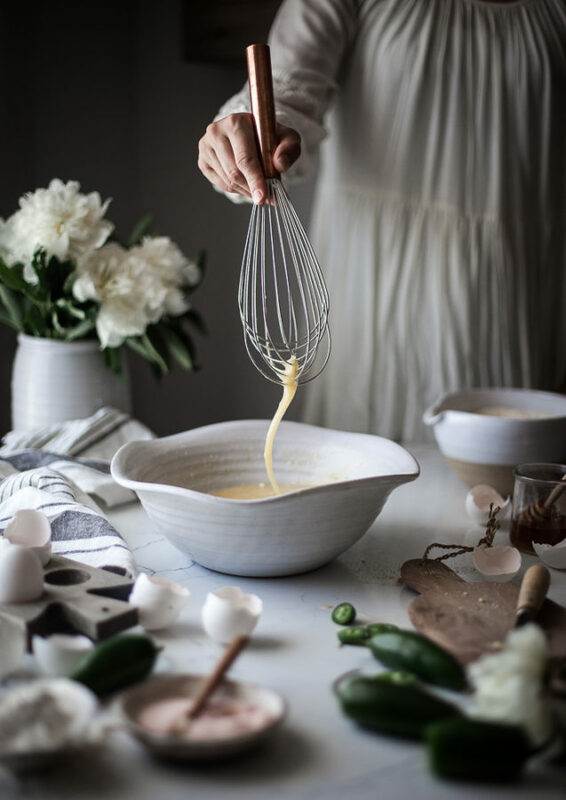 Whisk together and set aside. 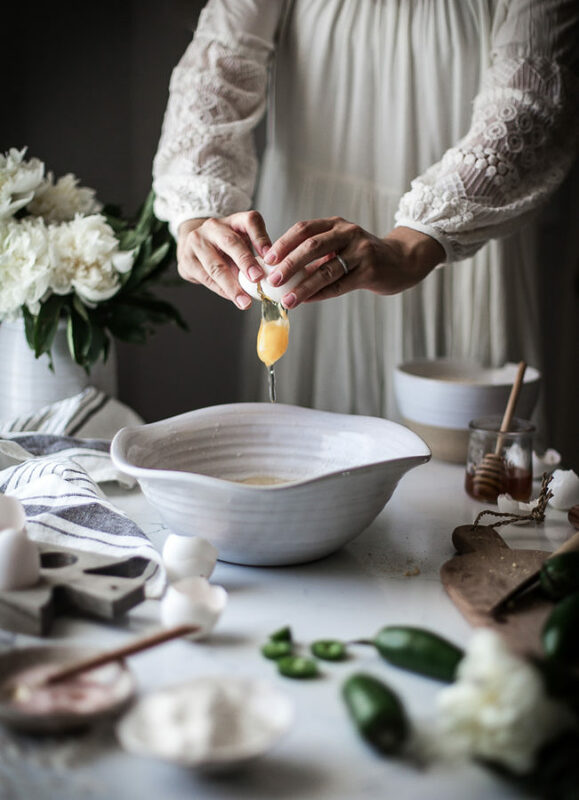 In another bowl, whisk together the melted butter, coconut oil, sugar, and honey. 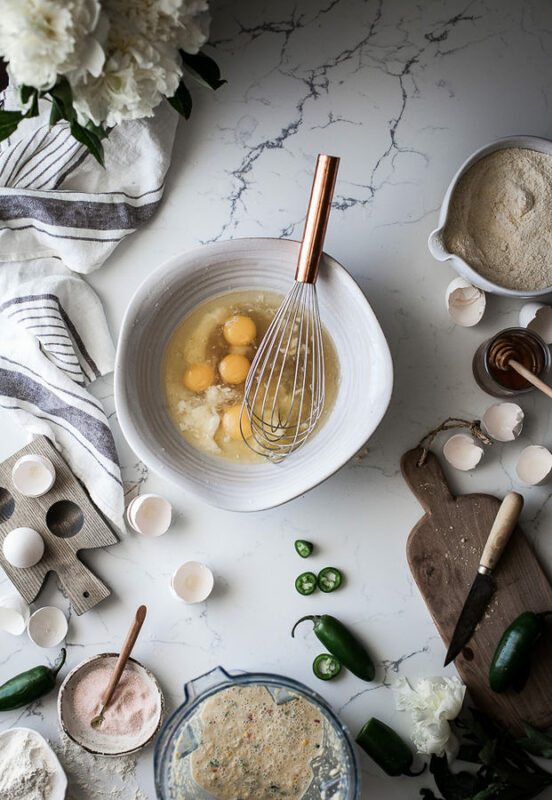 Whisk in the eggs, one at a time until each is fully combined. Set aside. Place the milk and corn in your Vitamix. Blend at speed 3 for 30 seconds, or until the corn is broken down into very small pieces. Add the de-seeded jalapenos and blend at speed 1 for 4-5 seconds, or until the jalapenos are chopped into small pieces, but not pureed. Whisk half of the dry mixture into the egg and butter mixture. Add half of the milk mixture and whisk until combined. 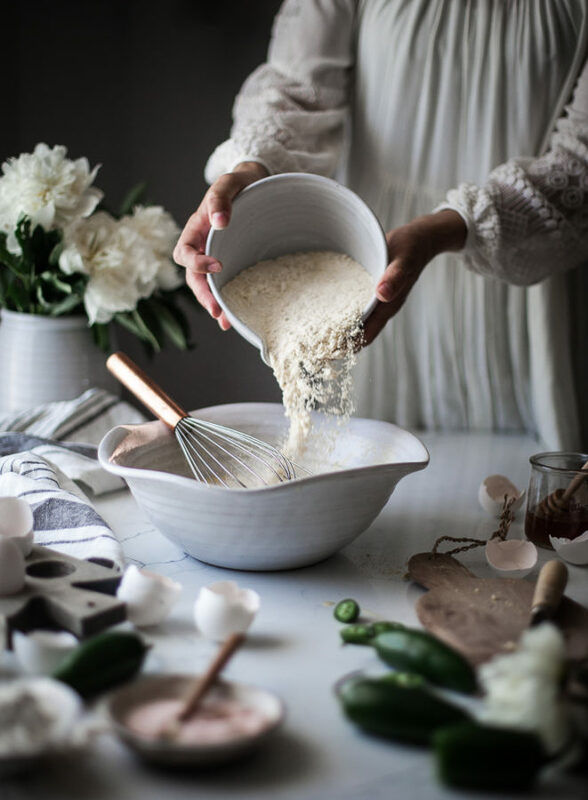 Whisk in the remaining dry ingredients, and then the remaining milk mixture, whisking until the batter is smooth and lump free. 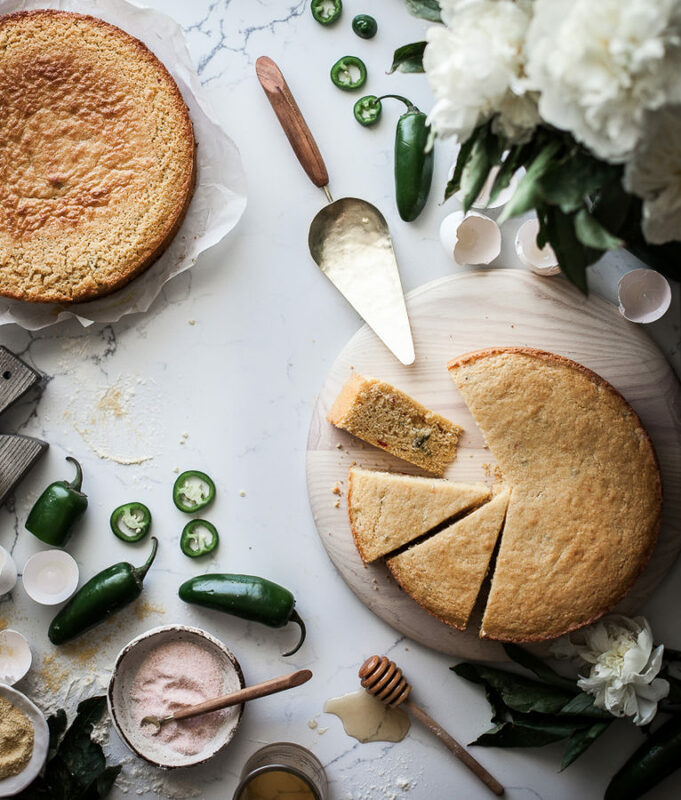 Pour the batter into the prepared pan and bake in the preheated oven for 35-40 minutes, or until the cornbread is golden brown on top and firm to the touch in the center. Remove from oven and let cool for 10-15 minutes. 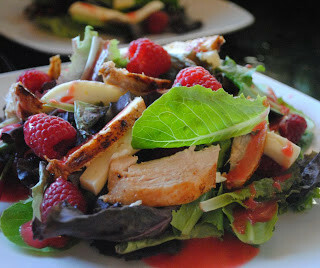 Remove from the pan and serve warm with honey butter and raw raspberry chia jam.